AMD APP Acceleration | Speed up the DVDFab performance by utilizing the latest hardware acceleration technology from AMD. AMD APP, the short for AMD Accelerated Parallel Processing, is a set of advanced hardware and software technologies designed to improve the video quality and at the same time, enhance the application performance. It makes the graphics processing unit (GPU) to work in conjunction with the central processing unit (CPU) to execute heterogeneously, so as to help reduce slowdowns and stuttering in intensive, media-rich applications, such as a image processing software or a video editing tool, presenting the end users the best application experience. As a video editing and processing intensive software, DVDFab has also applied this cutting-edge hardware acceleration technology in a couple of its products while decoding H.264, H.265, VC1 and MPEG2 videos and encoding H.264 and H.265 videos, currently in Blu-ray Copy, Blu-ray Ripper, Blu-ray to DVD Converter, Video Converter, and there will be more products benefiting from it in the future. Customers shall experience superfast processing speed and at the same time, receive very stunning video quality in the output results. To take advantage of the AMD APP hardware acceleration, users need first to activate the relevant AV codec’s at the Common Settings panel. To do that, just go to Common Settings > General > AV Codec, and then select AMD APP from each dropdown menu at the decoding and encoding sections, respectively. AMD APP to the H.265 sources under the decoder settings actually does not work at the moment, albeit the option is there, but it will be fixed soon. 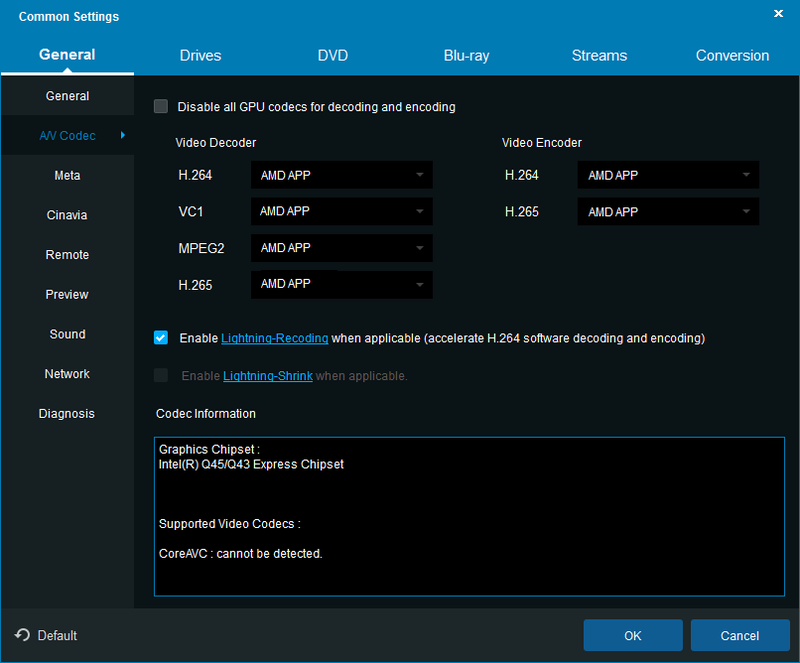 Although AMD APP features amazing performances while processing videos in DVDFab products, it does not mean all the graphics cards from AMD are empowered with APP technology. Here below is a list of supported GPUs that are currently capable of accelerated parallel processing. It’s better to check if your computer GPU is among the list, before jumping to the bus. To give you a direct impression on how the performance when AMD APP is turned on can outpace the performance without AMD APP, we run a few test on a few titles with AMD turned on and disabled, and then compiled this comparison chart so that you can have a direct visual impression.